Gingivitis is an inflammation of the gum tissue and the main cause of receding gums. Gingivitis infecting 95% of the adult population who suffer from periodontal disease. Gingivitis caused by various bacteria that inhabit the oral cavity. They can cause infection in the tooth that can encourage the emergence of tartar. Some common symptoms of gingivitis are swelling of the gums, pain in the gums, bad breath, pus between teeth and gums, and bleeding of the gums. Gingivitis can cause chronic periodontitis supporting the teeth recede and tooth loss. Periodontitis is caused by the accumulation of bacteria that is normally found on the bottom limit of the gum to the tooth. Periodontitis can aggravate heart conditions and kidney as two forms of diabetic complications. The effect of periodontitis is the main reason why this health disorder is referred to as a silent killer. Gingivitis cause symptoms such as swelling in the tissues of the gums, bleeding gums, pain in the gums, bad breath, and the appearance of pus between the teeth and gums. 1. Atherosclerosis: Inflammation triggers accumulation of fat and cholesterol in the arteries. 2. Diabetes: Type 2 can be triggered by periodontitis. Type 2 patients with periodontitis have a risk of heart attack 50% larger. 3. 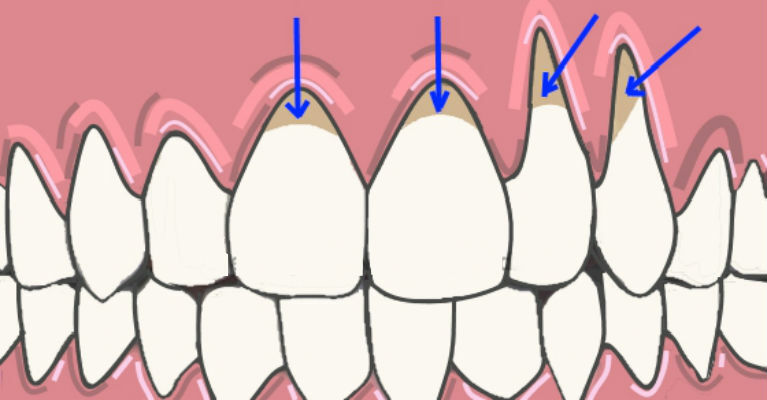 Stroke: Stroke can be triggered by periodontitis. 4. Cancer: Some studies have found that the cancer risk is strongly associated with periodontitis. 5. Premature birth and miscarriage: Can be triggered by periodontitis. Infections caused by bacteria so you have to focus on the removal of bacteria. The level of oral hygiene is strongly associated with the emergence of bacteria. Salt can function as a natural disinfectant. Use saline solution to rinse. Perform this step on a regular basis then you can get rid of bacteria in your mouth. Turmeric is an important part of the traditional medicine of ancient India and China. Turmeric contains curcumin, a compound that can give the effect of antioxidant, anti-virus, and anti-inflammatory. The Journal of Natural Science, Biology and Medicine indicates that a paste made from 1 tsp turmeric ½ tsp mustard oil with a ½ teaspoon salt can reduce the swelling associated with periodontitis. If you do not have mustard oil, you can replace it with coconut oil. A study published in the Journal of Agriculture and Food Chemistry states that sage can serve as a healing inflammation. You can brew some fresh sage leaves in glass water. Drink up to 3 times a day. Aloe vera can be used to clean teeth and gums. Journal of the Indian Society of Periodontology in July 2013 advocated the use of aloe vera in mouthwash. You can also use aloe vera gel by means of rub on the gums. You are encouraged to put some natural raw honey on the wound to prevent infection. Garlic has antibiotic compound called allicin. Journal of Medicinal Food in its November 2001 issue found that allicin can attack bacteria in the mouth, thereby reducing dental disease. Some doctors advise to chew two cloves of garlic and let allicin out over the infected gums. You can mix it with coconut oil and honey if you don’t like the taste of garlic. Virgin coconut oil has anti-bacterial properties so it is very effective in the treatment of skin infections. Vitamin E oil has the same function. By rubbing coconut oil or vitamin E oil on the gums, you can prevent infection. Olive oil can also be used as a cleaner of bacteria in the mouth. Take one tablespoon of olive oil and leave it in your mouth for a few minutes. It will get rid of some types of bacteria. You can prepare clove oil or tea tree oil as both have antibacterial properties, and these are very effective in treating gum disease. Be sure not to swallow them and use only gargle. These three ingredients have anti-bacterial effect that is strong and able to treat the infection. Use baking soda as toothpaste, and after brushing, use a solution of apple cider vinegar to rinse your mouth. Strawberries contain lots of vitamin C, able to fight various infections. Cashew nuts can prevent tooth decay, acne, and minimize the risk of tuberculosis and pneumonia. Coenzyme Q10 serves as enhancing the supply of oxygen to the gum tissue, thereby preventing gingivitis. The green algae has a compound that will stimulate the gum tissue repair. Brush your teeth twice a day then you will reduce the risk of bacteria. Although you see your gum bleeding, keep doing this dental cleaning. Make sure you can clean all plaque and leftover foods because they support the bacteria.